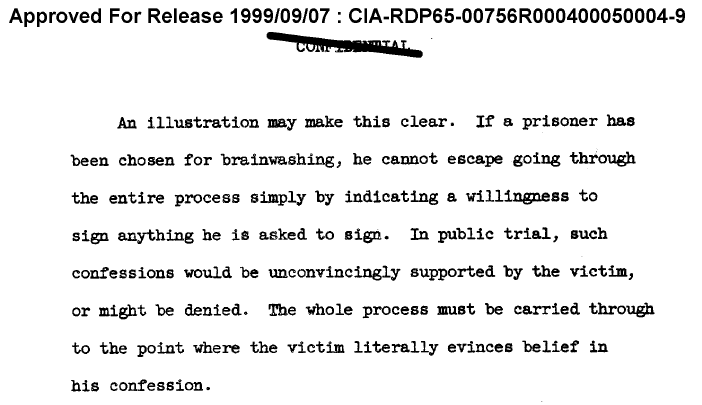 This screenshot from a document called “Brainwashing – from A Psychological Viewpoint”… it summarizes all the CIA’s brainwashing knowledge into one 90ish page document… but just the psychological stuff… no drugs or physical torture… well not a whole lot of physical torture at least. Pretty much just mindfuckery 101.. kinda like MKULTRA Lite. Here’s a few other screenshots I thought were interesting. Passage about how important it is that you make sure the victim actually believes what you are framing them for so in case they end up on trial.